What does the future hold? Are you going to win a zillion dollars? Become famous or infamous? Will Justin Timberlake ask you to marry him? Does your boss really think you're a jerk? 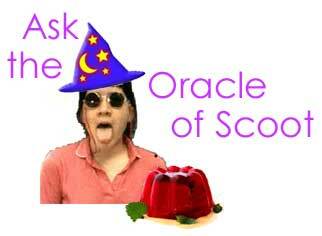 Ask the Oracle of Scoot! She will gaze into her Crystal Jell-o Mold and unleash the Secrets of the Ages. Make sure to phrase your question in "yes or no" format; essay questions require too much power for mere mortals to fathom.